Five percent of Hispanics in the US regularly go hungry and as many as 20% do not have sufficient access to nutritious food, a US report says. Poverty and lack of awareness about state entitlements are the causes, says the study by Hispanic civil rights group the National Council of La Raza. 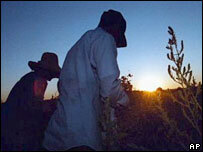 Immigrants also face a series of linguistic, legal and cultural obstacles in accessing enough food. Hispanics are the biggest single minority group in the United States. The study showed that the number of Hispanics going hungry was significantly higher than for non-Hispanic whites (3%), but lower than the figure for non-Hispanic blacks (8%). A similar number of Hispanics and non-Hispanic blacks suffered from a lack of access to healthy food, around four times more than non-Hispanic whites. "Lack of access to resources is forcing far too many Latino families into choices no-one should have to make, such as between having a roof over their heads or putting food on the table," said Janet Murguia, NCLR President and CEO. "A lack of affordable, nutritious food also has devastating health consequences, such as increasing hunger and obesity, affecting not only the Latino community, but the well-being of our entire nation." One of the authors of the study, Jennifer Ng'andu, said the Latino community was "practically invisible" when it came to the issues of hunger and malnutrition in the US.